Inferior people do not start a work due to fear of obstacles. Medium people start their work, but leave the work whenever they get difficulty. Exceptionally good people start their work, and continue working even if there is a series of obstacles in their way. In India, obstacles are part of life for millions of Specially Abled People. ATMs, Banks, Hospitals, work places, offices, buses, trains, as if everything is out of reach, not accessible. However Voice of SAP team saw opportunities for solutions in obstacles. Voice of Specially Abled People initiated and presented Vision 2020 for The Specially Abled People of India. It published articles in Sep 2014 and pursued “Accessible India Campaign” with H’ble PM Shri Modi ji and Govt. of India. It is our proud moment to see H’ble PM Shri Narendra Modi launching “Accessible India Campaign (Sugamya Bharat Abhiyan)” on Dec 3 2015, to jump start transformation, creating massive awareness for disability sector. VoSAP has been working on multi pronged approach as part of road map to achieve Vision 2020 such as providing Policy Inputs to NITI Aayog on Assistive Technologies, proposals to Railways, Finance and 7 other ministries for adopting inclusive policy decisions. With the launch of AIC by H’ble PM himself, People of India and millions of his supporters – Globally will take a note of India’s strong commitment to Empower Specially Abled People. 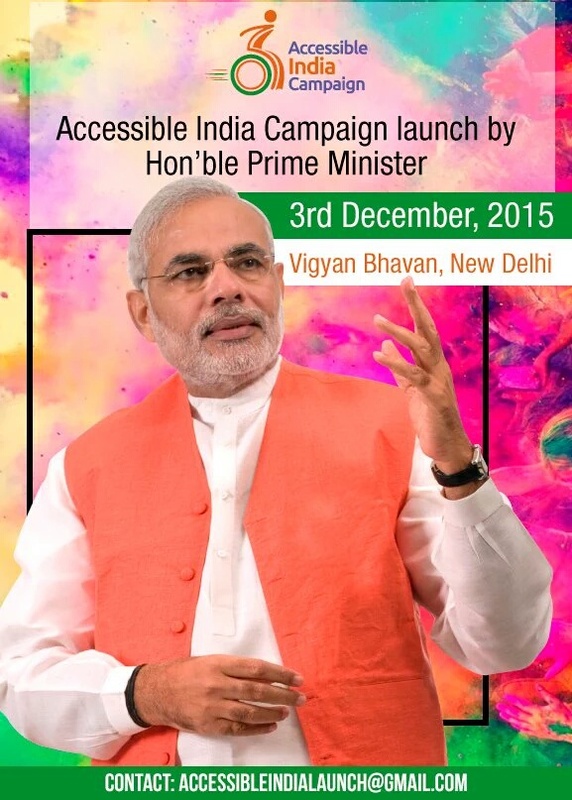 This will be the biggest and historic initiative for the Specially Abled People in India by Govt. of India! Accessibility in transportation, building infrastructure and digital infrastructure will pave the way for providing opportunities to get education, employment hence the Empowerment of SAP. This countrywide campaign is expected to inspire individuals to think and act inclusively so that eventually Indian society becomes inclusive. We request our social, spiritual and corporate leaders also to join this campaign. When all of India joins the Maha Yagya of “Accessible India Campaign”, the volunteers of Voice of Specially Abled People are gearing up to play a major role! Thousands of volunteers are inspired to start pursuing following action items to make their surroundings accessible. Publish the “Hall of Fame” – the buildings which were made accessible, on our website, FaceBook and on your social media accounts, so that others can get inspired! Inspire all your friends, colleagues and gradually the whole area into the mission mode and lets really make it, “Accessible India”! All our volunteers are very eager to see the impact of “Accessible India Campaign” reach every district and village of India. We wish all the best to our all the volunteers and heartily thank H’ble PM for once again charting a new path! Roots of the sandalwood tree form a shelter for the snakes, on it’s top birds take rest, on it’s branches monkeys are playing and one can find bee’s on it’s flowers. Really, the ultimate aim of the good (‘sajjan’) people is to offer helping hands to others (‘paropkar’)!